Actors Amitabh Bachchan and Taapsee Pannu who gave the Big hit film Pink in 2016 are back one more time with a Hard Hitting film directed by Sujoy Ghosh. Yes, Amitabh and Taapsee starrer film Badla First Look Poster have been revealed today and Trailer to be out tomorrow on 12th February. The film is the remake of the 2016 Spanish thriller film Contratiempo. 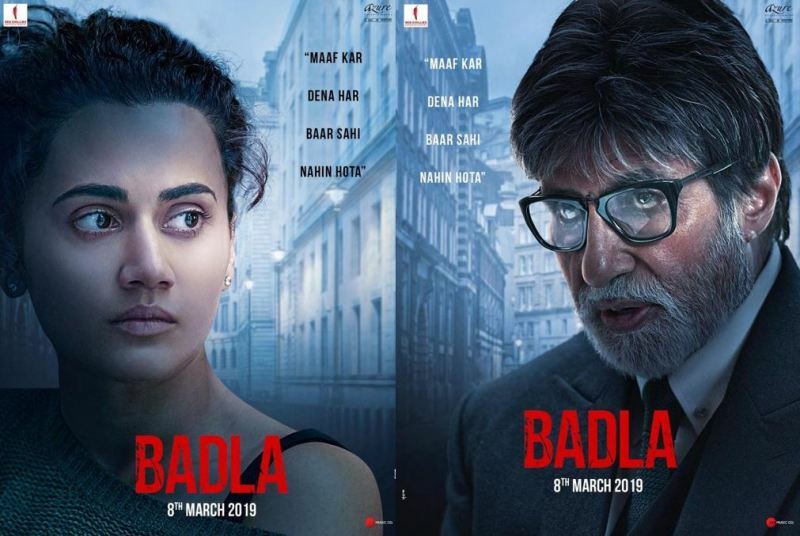 Badla First Look Posters out featuring Intense Avatar of Amitabh Bachchan and Taapsee Pannu. Badla First Look Poster mentions, “Maaf Kar Dena Har Baar Sahi Nahin Hota”. Badla First Look Poster itself creating lots of excitement and Badla Trailer release tomorrow will give more of it. Sujoy Ghosh’s Badla film is produced by Gauri Khan under the Red Chillies Entertainment banner in association with Azure Entertainment. Badla Scheduled to release on 8th March 2019.